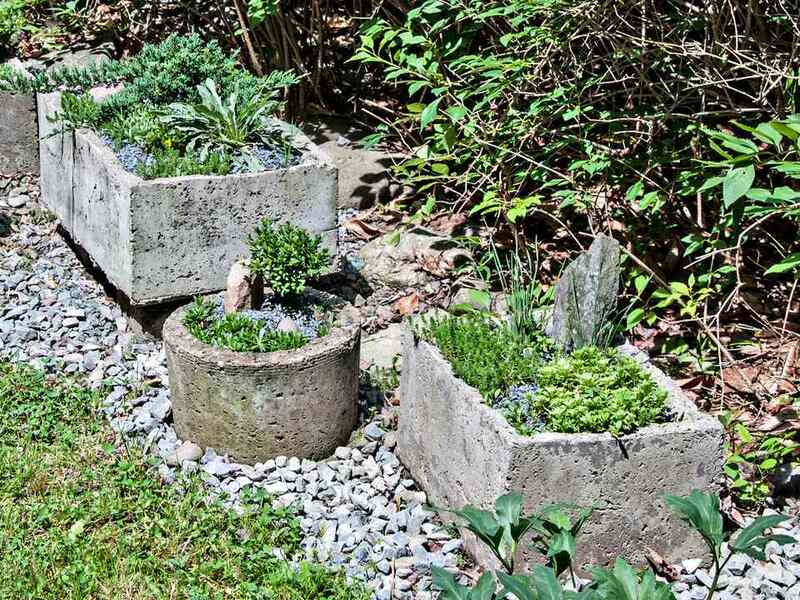 Hypertufa planters are a wonderful way to bring the look of stone into your garden, without the weight. Hypertufa, (sometimes written as Hypertufa or hyper tufa), is a cement-based mixture that is used as a substitute for real tufa. True tufa is a very porous type of limestone. It's beautiful, but much more expensive than hypertufa and heavier to move around. Hypertufa was invented for use in alpine gardens. Alpine gardeners originally used antique animal watering troughs, which became rare and expensive. Tufa itself is becoming increasingly hard to find and very pricey. Hypertufa looks very similar to tufa and is easy to make yourself at home. Although it can be messy, it’s also a lot of fun and the list of things you can make from it are quite varied. Hypertufa troughs are a classic and one of the simplest uses of hypertufa. You can also craft ornaments, stepping stones, birdbaths and just about anything you can mold or shape. The amounts needed will depend on the size of whatever it is you are making. The proportions are approximately 2 parts cement to 3 parts each of perlite and sifted peat moss, plus a handful of reinforcing fibers and all the water it takes. For an 18 x 12 x 6-inch trough you will need about 12 lb. Cement, 2 gallons each of peat and perlite, and a handful or two of reinforcing fibers. You will also want some type of large tub, to mix it in. Heavy-duty rubber gloves, preferably the chemical resistant type, a dust mask, a screen or sieve to get the lumps out of the peat moss, and a stiff wire brush, to finish the edges and give your hypertufa a weathered look. Things can get quite messy, from mixing the ingredients to hosing out your tub. Working on a tarp or a sheet of plastic is advisable. You will also need a large plastic bag, to hold the trough while curing. And finally, you will need some type of mold or form. You can buy molds for making hypertufa troughs, stepping stones, and other creations, but you can also make a basic trough with a plastic tub or even a couple of cardboard boxes. Plastic, cardboard, and Styrofoam are the best choices for molds because the hypertufa will not stick to them the way it can in wood or metal. If you want to form your hypertufa over a something like a metal bowl, place plastic between the metal and the mixture. Find 2 similarly shaped, but different size boxes or plastic tubs, so that the smaller container nests inside the larger one, with about 1 -2 inches of space between them. The larger the trough, the thicker the sides will need to be. Curved sides should be at least 2 inches thick. Put on your gloves and measure out the ingredients by the proportions given above. Add these to your tub and mix them together as best you can. Add water a little at a time, to thoroughly dampen the dry ingredients. Test for the right consistency by squeezing a handful of the mixture. When it holds together and barely drips, let it sit for 5 - 10 minutes to set up. Then it's ready to use. If the mixture gets too wet, add more dry ingredients. A watery mix will not cure properly and will turn out brittle. This is the fun part. Pat a 1 - 2-inch layer of the mixture on the bottom of the larger box. Place the smaller box on top of that layer, centering it. Then start to pack the mixture between the sides of the two boxes. When you reach the top, smooth it off, if you want a level edge. Alternatively, you can press in leaves or make any decoration you like. If you are working with an overturned, rounded mold, such as a bowl or pot, begin by making a 2-inch ring of mixture around the base of the mold and slowly build it up and over. Once completed, your hypertufa will need to cure for up to 3 days. Curing means allowing it to dry and bond together into a sturdy product. Curing is down in 2 steps. Step 1: During this first curing stage, it is best not to move the trough. Place it in a plastic bag and place it in a sheltered spot, out of direct sunlight. Overheating in the sun can cause hypertufa to cure unevenly and crack. The plastic allows the mixture to dry slowly and develop its rigidity. Allow 12 - 36 hours. Test it for doneness by poking the side with your fingernail. If your nail does not pierce the mixture, it is ready for Step #2. If it does, let it cure a bit longer and retest. Once it has hardened, you can carefully remove it from the mold. Tapping the sides gently with a rubber mallet can help loosen the hypertufa from the mold. Then use your wire brush, sandpaper, or a file, to remove any rough edges. You can also use the bristles to add texture to the walls of the trough. Step 2: Once it meets with your approval, place it back in a shady spot for another 3 weeks. At that point, the trough should be a lighter color and should weigh much less, now that the water is gone. The trough is now cured, but it still has a high concentration of lime in it and that can be harmful to plants. The final step is to leech the trough. You can do this by pacing the trough on a shallow tray and filling the trough with water. It should drain slowly, taking some time with it. Refill the trough as needed for the next 7 - 10 days. If you live in a rainy area, you can simply leave your trough outdoors and let the rain leech it for you. Hypertufa is a porous material, but if you'd like to add drainage holes, you can use a small (3/8 inch) masonry bit and drill them in, after the final curing. At this point, your trough is ready to plant. You can plant anything in your trough, but they are especially good for plants like alpines and succulents, such as hens and chicks, that appreciate well-drained conditions. Soilless Potting Mix: What Is It and Why Is It So Important? How Do You Use Coir in the Garden?